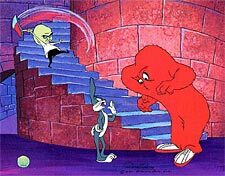 Inspired by two classic moments in the 1952 ‘Water, Water Every Hare’, Bugs engages Gossamer in conversation as the Mad Scientist descends the castle stairs, axe poised to split a hare. This artwork was created from an original drawing by legend Chuck Jones. Inspired by a classic moment from the original production directed by him, this edition bears the signature mark of Chuck Jones.